The sentiment of the experts at 2014 Cityscape Global is that Dubai residential property is “cooling”. That said, the words “bubble” and “bust” are studiously avoided, almost as if a communications guideline had been issued. Depending on who you talk to...prices went up easily by 50% and perhaps by 70% over the past five years since the bottom in early 2009; everyone appears to agree that they are back to where they were in January 2008. What happened between then and now is a subject of collective amnesia as are many of the statements made at the 2008 Cityscape...for example the spectacularly miss-timed pronouncement by one expert... “Investors say 2009 will be the best year for real estate investment in MENA, ever”. This is our model of Dubai’s residential property prices published in July 2009. It offered an explanation of what had just happened (the Bubble & Pop); with a prediction in hard numbers for what was going to happen next. The historical line was based mainly on tracking asking prices of apartments in the Greens and Dubai Marina and weighting those back to a smaller data-base of actual transactions. It may not be representative of the market as a whole; compared to other indexes up to 2009 it agrees pretty well with Colliers and ASTECO, there is however a wide variation of opinions regards to the details amongst the experts. All the same, no one disagrees that there WAS a bubble up to late 2008 and there WAS a bust. The thesis behind the prediction, i.e. the dotted-line, (explained in that article) is that in every market there is the “correct” price. But markets sometimes go into “disequilibrium”. When that happens, the amount of disequilibrium “UP” tends to be reflected in the amount of the subsequent disequilibrium “DOWN”. The Big Idea is bubbles create no economic value. In other words they are zero-sum... there are winners who bought low and sold high, and losers who bought high and sold low. Net, on average, no one made any money except the real estate agents and sometimes the bankers....although often the bankers end up playing the role of fall-guys of last resort. From a practical standpoint, if you know what the “correct” price is; the theory says you can make reasonably accurate predictions about the gyrations in the immediate future, following the bust. Granted working out the “correct price” requires an understanding of valuation as in figuring out what International Valuation Standards calls “Other than Market Value”. Often the experts call that “Fair Value” although there is nothing “fair” about it. More confusing, different experts have different definitions about what “Fair Value” means, so it can mean just about anything, which is why real estate agents use the words “Fair Value” all the time, in the same breaths as “sought-after”, pristine” and “prime”, whatever those words mean? Semantics aside, if you know what the price “should” have been, if not for an episode of “disequilibrium” then after a bubble pop’s you can figure out (1) at what point the prices will likely bottom, and (2) where they will bounce back to, that’s the dotted line on the chart. You also get an idea about (3) timing, although as is explained below, that’s harder to predict because it depends mainly on how long it takes the banker-fall-guys to wake up from their jingle-mail-induced paralysis. This is what happened according to the three leading House Price Indexes for Dubai. So, if the model that pretty much predicted 75% of prices over the past five years; is correct; then that 50% to 70% price rise was a “bounce” not a “bubble”. With regard to what happens next, there is little evidence of activity likely to result in a bubble. Banks are still being conservative, and there are laws in place restricting “flippers”. 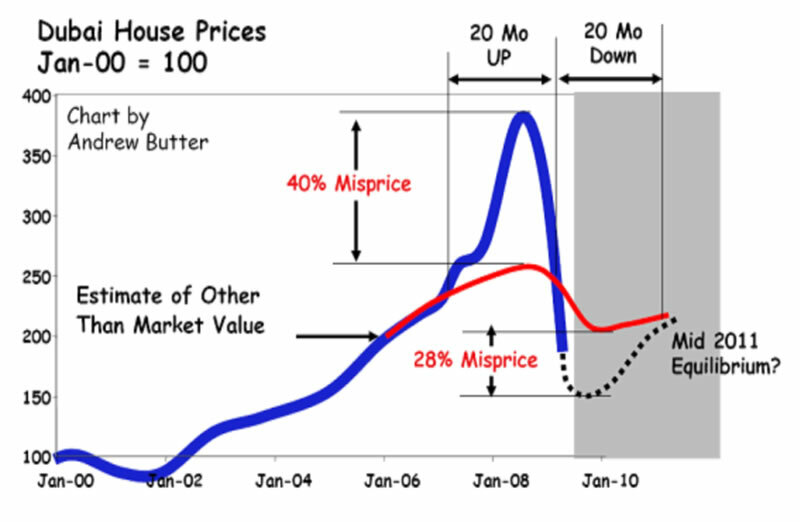 There is plenty of evidence that the market is at about what the real estate agents call “Fair-Value”, there is more information around than there was in 2006/8, price/rent ratios are sensible, and ever so slowly there appear to be some laws getting in place. So, back to a new normal; if you want to buy a house/apartment in Dubai because you might want to live in it, then it’s not a bad time to buy...and it’s highly unlikely you will experience the nightmare of watching a bust unfolding, the moment you sign on the dotted line. But don’t expect the kind of windfall capital gains that happened over the past five years.